| Recording our life, our family, our home, our mess, our love. Recording our life, our family, our home, our mess, our love. So….. everyone’s allowed two off-days right? I did not wake up feeling fresh as a daisy on Saturday morning like I’d hoped, and so the day didn’t exactly go to plan. It turns out I had a bit of a cold as well as the general Mummy exhaustion, so I needed a bit more than the 5 hours sleep that I had managed to get, to recover fully. Luckily for me, I have an absolute gem of a husband, who despite being only slightly less tired than me, got up with the kids at 6am and left me in bed. Where I stayed for most of the morning. I know, I thought Mother’s Day had come a day early! I’d love to say it was blissfully relaxing, I really would, but that would be a lie. I mean, I was as relaxed as a Mum can be when all three of her children are still in the house. I did manage a bit more sleep in between having Ernie brought to me for feeds what seemed like every hour, having the girls run in and jump on top off me and put their COLD feet on me, and hearing the bangs and crashes and shouting and trying not to think about what state the house would be in when I got up. Mabel came in and I asked her what they’d been up to. ‘Well, Greta’s been watching paw patrol, Daddy is changing Ernie’s nappy, and I’ve been screaming about yoghurt….’ Ah, the Mummy lie in, almost not worth it, but not quite. If you’ve read the children’s book ‘Mr Large in Charge’ by Jill Murphy, it was basically that (if you haven’t then do because it’s a brilliant book). I still wasn’t feeling too great when I got up, so we decided to cancel our plans for the afternoon and have a movie night instead. I brought the duvet down to the sofa, Greta and I microwaved some popcorn and we all snuggled up to watch Monster vs Aliens. By the time it had finished neither me or Carl could be bothered to cook so we ordered a Chinese. Mabel asked ‘do they eat chips in China then?’, And Greta filled up on prawn crackers. Currently I’m sat on the sofa with Ernie while Carl puts the girls to bed. I’m pretty sure he’s fallen asleep too, but I can’t decide whether he would want me to wake him or not. I think I’ll leave him a bit longer. Now, I know I’m not going to win any prizes for photography with these photos, but I love them, because they just capture our family (including Dexter the cat) at our most ordinary, and that’s what it’s all about. Writing this post is a bit like free therapy for me today. I’m writing this on Friday evening and I’ve done that thing where I get so tired that I kind of lose all enthusiasm for life and genuinely feel like I’m incapable of basic things like cooking dinner and getting dressed. As I’m sure you can imagine, this is not really compatible with life as the main responsible adult for 3 children, so today was a bit of a struggle. But we made it (thank you YouTube Peppa Pig compilations). The girls have had way too much screen time today and I have eaten way too much chocolate. Oh well, everyone’s allowed an off day, we’ll make it up tomorrow. Right now I’m just going to write a list of happy things from this week and then crawl into bed (and hopefully wake up a new woman in the morning). First of all some bloggy things. I’ve had some lovely comments on some of my posts this week, especially my Mother’s Day present conundrum post and it’s great to know that I’m not on my own with the Mummy guilt and hopefully inspired a few people to show themselves some love and give themselves a little gift on Sunday. I’m really loving writing this blog and it’s nice to think that maybe a couple of people like reading it too. On Monday my Mum surprised me by coming to help with the absolute military operation that is taking Mabel to her morning ballet and tap class. Mabel absolutely loves it, and she looks so cute in her little leotard, but oh my goodness it’s a lot of effort to get her there. Dragging a buggy up four flights of stairs and then getting Mabel changed while keeping an eye on Greta, all of this with a baby strapped to my chest in a wrap, is not the easiest thing in the world, so it was great to have an extra pair of hands. Ernie has been loving some tummy time this week. He’s really strong now and lifts his upper body right up and kicks his legs around, I’ve got a feeling he’s going to be an early mover like his sisters (lucky, lucky me). He can roll from front to back really easily now, which Mabel thinks is hilarious, but then he gets stuck trying to get himself back on his front bless him. Of course on Thursday we had my world book day win. I loved seeing how happy Mabel was to be going to preschool dressed up, and she was extra excited when she got there because one of the teachers was dressed as Little Red Riding Hood too! Of course Greta had to dress up as well, so she put on her Cinderella dress to spin around the front room in. The girls got out in the garden for a bit this week (yep, in their dressing up clothes) as it’s not been quite so freezing cold. Mabel’s only stipulation when we were house hunting last year was that she wanted a garden with grass in, so it’s great to see her getting to enjoy it. We were very lucky and the previous owners left a little play house and trampoline for us too, so they are basically living the dream when it comes to outdoor entertainment. I always thought I was going to be one of those perfect Pinterest mums, I don’t know why or what led me to think this, given that I have no aptitude in crafts or baking or art, I can’t even fold my sheets neatly if I’m honest. But for some reason or another, when I imagined my future mum self, I saw my children in beautiful clothes, all handmade by yours truly, despite never having had much success with a sewing machine before. I truly believed that they would sleep in their gorgeous colour co-ordinated nursery, complete with hand painted mural on the wall and stunning crochet blanket (made by mummy of course) to snuggle under. Now, I have since realised that my ability doesn’t quite match my enthusiasm when it comes to all things hand crafted, but I don’t let that stop me. I still throw myself headlong into most projects, with the reasoning that a bad job done myself, is still better than something mass produced and impersonal. So you can see where I’m going with this, if my children are dressing up as book characters for school, you can be damn sure they are doing it in something with wonky stitching and frayed edges, fresh off of Mummy’s sewing machine. So about 2 weeks ago, I started seeing posts popping up about World Book Day, and I thought ‘lovely’, because I love books, especially children’s books. And then the more posts I saw, the more worried I got. The costumes got more elaborate and the parents got more frantic, trying to source the perfect accessories for their child’s chosen character, the more obscure the better it would seem (where does one find a child-sized monocle?) Gosh, I thought, since when did World Book Day become a competitive event? I’m glad we don’t have to deal with that yet. I’ll put it on the calendar for November, that should give me plenty of time to prepare for World Book Day 2017, Mabel’s first one after she starts school. I don’t want to end up having to get a (gasp) shop brought costume of a (bigger gasp) Disney Princess, and have people think that I can’t cope with life. So I was feeling pretty smug, thinking of all the time I had to plan Mabel’s 2017 World Book Day costume (I was thinking maybe young Jayne Eyre?). That is until Mabel’s preschool updated their facebook status (I know :eye roll:) on Friday evening, informing us that they will indeed be dressing up for World Book Day and would like to ‘invite’ all the children to join them. Now you know, this is not an invitation, an invitation is something that you can accept or decline. No self respecting parent sends their kid to preschool in jeans when everyone else is in a costume (not on purpose anyway), there’s no choice involved, you just have to do it. But it’s ok, we still have the weekend, we can sort something out. When I first ask Mabel about it, I heavily steer her in the direction of Katie Morag. It seems perfect, strong feisty female character, brilliant books, Cbeebies adaptation so all the children will know who she is. Perfect. I’m not sure Mabel can do the accent, but there’s time to practice. And how hard can a Katie Morag costume be? It’s just a kilt, a white knitted jumper, and some wellies. Well, it turns out it’s actually quite hard to find a green tartan skirt and a chunky knit jumper in the shops when they have all changed to their Spring lines already. In a moment of desperation I started googling knitting patterns for jumpers. I stopped when I remembered it had taken me the whole 9 months I was pregnant with Greta for to knit a tiny baby blanket and it was still too small. I didn’t have the time for that (or the skill, but I’ve never let that stop me before). At this point I was out of ideas, and I’d wasted the whole weekend doing silly things like living my life. If only I’d started knitting on Friday night, I could have worked all through the weekend, I’d have at least got a sleeve done by now. I went back to Mabel and asked her what her favourite book was. She wasn’t sure, so she went to consult her bookcase. She came back clutching a board book, ‘Each Peach Pear Plum’. Ok, we can work with this, what would you like to be from this book? You could be Mother Hubbard, or Cinderella, maybe Little Bo Peep, or the Wicked Witch? The next day Carl text me from Aldi, ‘they’ve got a Little Red Riding Hood dress here, shall I get it?’. I reply yes, dejected and disappointed. How has it come to this? I’m trying to channel Julie Andrews here and my daughter will be going to preschool in a 100% polyester dress from a budget supermarket. I’ve failed my poor daughter. Maybe I shouldn’t send her to school in September, I should probably keep her at home and save her the embarrassment. How has your World Book Day 2016 experience been? Any rookies out there like me? How do you deal with the competitive mum pressure? Thank you for reading! Come and find me on Twitter/Facebook/Instagram, follow by email if you want to make sure you never miss a post, and if you like this post, I’d be absolutely made up if you shared it! I’ve always thought that there was nothing more ridiculous than buying yourself something and then giving it to someone else to wrap up and give back to you as a present on a special occasion. And we all know someone who does this right? Surely the whole point of receiving a gift is the anticipation, the surprise, the wonder of ‘how did they know?’ and the gratitude for their generosity to think of you. Buying something for yourself takes all of the joy out of getting a present doesn’t it? It’s just putting on the show of recieving a gift, and what purpose does that serve? I remember clearly, last year around Mother’s day, expressing my distaste of such mad behaviour. Mother’s day is the absolute worst day of the year to be buying your own presents for. The whole point of Mother’s day is to feel the love and adoration of your family for a years worth of hard Mothering, and how exactly would buying yourself something do that? Nope, I had my cards made by the girls, my new scarf chosen by Mabel, and my favourite chocolates and I was happy. I would never be the kind of Woman who bought their own Mother’s day present. It happened kind of by accident. I was just browsing Instagram when I saw a post that caught my eye. Crafted Sisterhood were down to their last few Mama Fuel mugs and I’d had my eye on one for a while. Before I knew it I’d rushed over to their site and with a couple of clicks it was mine. Yay! Well, until the guilt set in. I couldn’t help it. It was only a mug, it cost less than 10 pounds. But, I have lots of mugs already, the Aero mug I got with an Easter egg 5 years ago is still going strong. And here’s the thing, I don’t go out to work, I don’t add a single penny of income to the family pot, so what business have I got buying something for myself that I really don’t need? And not only that, but why am I buying things for myself when I should be buying things for the children? Mabel really needs some more shopkins, and Ernie only has 6 pairs of dungarees…. what kind of Mother am I? So that’s when I hatched the plan, Carl and the kids could give it to me for Mother’s day. Then I wouldn’t feel bad about buying myself something as frivolous as a pretty mug, because they would have got me something anyway, and most importantly, it saves Carl a job. This way he doesn’t have to go to the trouble of thinking of something that I’d like and then find the time to go out to the shops without me around. He works hard, and then when he’s at home he’s just as hands on as me, the last thing he needs is the pressure of getting me a present on top of that. So, that’s how it happened, it took me nearly four years and three children but I’m finally there, I’ve turned into ‘one of those Women’. And I was fine about it. I still knew that a present I had bought for myself and then pretended was from the kids and Carl, wasn’t really a proper Mother’s Day present, but I didn’t care. I’m lucky enough that Carl and the kids make me feel appreciated every day. Mabel with the pictures she draws for me, Greta with her snotty kisses and ‘luffs ouuu Mummy’, Ernie with his biggest smiles that he saves just for me, and Carl with the bar of chocolate he brings me after work when I’ve been hounding him all day with ‘THE KIDS ARE TRYING TO BREAK ME’ messages. I don’t really need a present and a special day to feel the love. I suppose maybe this is my first Mother’s day when I’m feeling pretty secure and confident in my role as a Mummy, at least from my little family’s point of view. I already know that they think I’m doing a good job. Except of course that what I’d done was completely ridiculous, and I knew it was. Firstly, Carl wanted to get me a present (a proper one that he got to choose), so I was most likely going to end up with 2 presents anyway. And then Mabel started telling me about how she was going to pick something for me with Daddy (‘when you’re not looking Mummy, and I’m not going to tell you what it is, it’s got to be a surprise!’). I had forgotten that the giving part was just as important as the recieving part. It’s not all about me, in other words. And secondly, why do I feel guilty for treating myself? I know I’m not the only Mum that feels like this, whether it’s spending money or time on something just for yourself, there’s always the guilt, always the need to justify it to yourself. It’s not something that anyone puts on me, it’s just something internal and I’m not sure where it comes from except the intense love I have for these little ones and my natural instinct to put them at the heart of everything I do. In fact, I haven’t asked him but I’m pretty sure Carl feels the same way because he hardly ever does anything for himself either. Being a parent, you get so used to putting everyone else first, it starts to feel really strange when you do anything for yourself. So that’s why I’ve decided…. I’m giving myself the bloody mug for Mother’s day. This Mother’s day, I’m going to say to myself ‘Of course you deserve a little treat, you work hard to raise these children and you are doing a perfectly acceptable job at it’. It’s very rare that I give myself a pat on the back, but I think Mother’s day is the perfect day to do it. And I think everyone should do the same, if they don’t already. Buy the thing that you don’t need but just looking at it makes you happy. Take some time for yourself to do something entirely self indulgent. Do it because you want to do it, and don’t ask anyone’s permission. And for one day, try not to feel guilty about it. Have you ever bought your own present? Do you feel guilty buying things for yourself or doing things for yourself? Or do you make a point of a little self gratification every now and then? I’d really love to know everyone’s thoughts on this one. Thank you for reading! Come and find me on Twitter/Facebook/Instagram, follow the blog by email if you want to make sure you never miss a post, and if you like this post, I’d be absolutely made up if you shared it! This morning, the Toddler and I gave her babies a bath. Greta is rather obsessed with her babies and she loves looking after them, she even calls herself ‘Mama Greta’ and talks to them lovingly as she drags them along by the foot (not a parenting skill she has learnt from me). She carts them around all over the place and they were starting to look a bit grubby so I thought it was about time they had a good scrub. Because of her love of all things baby, I always knew she was going to be a brilliant big sister, helping with nappy changes and always ready with a cuddle and a sloppy kiss. What I didn’t think about was how heavy handed she can be when she gets over excited and, being a toddler, her lack of self awareness makes her a bit of a danger around a real life baby sometimes. So, I’m trying to reinforce how gentle and careful you need to be around babies, and in the interests of safety, I thought perhaps we should start with a toy baby. I probably should have done this before Ernie was born, but hey ho, he’s not been hurt so far, so no harm done (although we’ve had some near misses). She seemed to get the idea quite quickly to be gentle like it was a real baby. She pretended to wash the babies hair and gave the baby a ‘massage’ bless her. She even gave herself a little wash! Have lots of towels on stand by if you’re going to try this, everyone’s going to get wet! Obviously I’m not going to start letting her bath Ernie on her own! But I feel like she understands a little bit more about being gentle around babies. And she loved the chance to be ‘Mama Greta’ again. I wish I’d done more things like this before Ernie was here so she would have been a little bit more prepared for what life with a baby was going to be like. I love a home made gift that I can make with the children. They love to give presents that they have made and its nice to show them that giving presents isn’t always about spending lots of money. Especially on Mother’s Day, I think it’s really nice to give a handmade keepsake gift to the grandmas. So this weekend I had one of my “brilliant ideas” for something to make. As usual, this started with Carl sighing and rolling his eyes at me as I sent him off to buy supplies, and ended in a big mess and a creation that we are all a bit surprised is actually rather nice. My idea this time was to decorate a canvas with tulips made from the children’s footprints. Trying to get footprints from 3 wriggly children is always a dangerous game to play, one slip and you’ve ruined the whole thing, but I’ve had a lot of practice and I was feeling brave. My top tips are to sit the child on your lap, make it as quick and as fun as possible, and always do one more than you need, just incase. After we’d restrained them for long enough to get 9 footprints each, it only seemed fair to let them loose to go wild with the paint on a big bit of paper. Maybe not Pinterest worthy, but I’m sure Nanny and Nana will each treasure their home made present and hide them in the spare room display them proudly for years to come (or at least a week). Yesterday, we spent a very chilly couple of hours at the farm where we have an annual membership. It was fun, as always, but it was really cold. Well, along with the feeling in our fingers and toes, we must have temporarily lost our minds, because we decided it would be a great idea to pop into The Harvester on the way home for our dinner. It wasn’t really until we’d got in and sat down, that I realised what we had done. It was the first time since we’ve been outnumbered by under fours that we’ve attempted to go to a restaurant. I was a bit nervous I must admit. Would Mabel spill her drink all over the table like she so often does at home? Would Greta wet herself and then insist on stripping off her bottom half right there at the table? Would Ernie cry loudly until Carl puts him in the wrap and stands up bobbing around next to the table, shovelling food in his mouth in between patting his bum? Well, the answer was yes, all of those things happened. A particular highlight was Greta standing on her chair, naked from the waist down, wiggling her hips and singing ‘I got my bum out, I got my bum out’. I covered her up as quickly as I could, but she’s quite the exhibitionist it would seem. But despite all the craziness, we had a brilliant time. The staff were lovely, coming over to help clear up Mabel’s drink and replacing her soggy dinner straight away. If the other diners gave us any funny looks then I didn’t notice, I was too busy laughing at my children’s crazy antics anyway. Something that I’m learning about life with my three little ones is that nothing is ever going to be straight forward again. Every day is always going to have it’s mad moments and upsets, and it’s very easy to feel my stress levels rising, especially when we try to leave the house. But if I try to relax, go with the flow, remember to laugh, and always choose a family friendly restaurant, everything will be ok. I brought a 90p bunch of Daffs from Aldi on Monday and I’ve pretty much been smiling ever since. I love having flowers around in the house, and nothing quite says Spring is on the way like a jug full of cheerful yellow Daffodils. The sun has been making an appearance at the window lately too and it’s making me feel really optimistic and positive. Hopefully this is going to signal the end of the winter virus cycle of hell we’ve been trapped in since December. I absolutely loved the messy play activity that I did with Greta on Tuesday. It was so nice just to sit and watch her exploring and experimenting with it. I’m excited to plan our next activity so check back on Tuesday to see what we get up to. I also bought a pretty notebook when I was in Aldi and who doesn’t love beautiful stationary? I had a chance to sit down with a cup of tea and plan out some blog posts, which was lovely. What an exciting life I lead, where writing a list makes it into my top five moments of the week. I can’t help it, I just love a list! Yep, Greta customised the cover a bit for me. I’m using my camera a lot more since starting the blog and I’m really enjoying it. Out of a few hundred photos, I’ve even managed to get a couple in focus! I don’t know why but we’ve had this camera for over 5 years and I’ve never really worked out how to use it properly before. I’m trying to change that now though and find out how to improve my photography skills. I really enjoyed reading Char’s top photography tips over on Our Life as we see it and I’d love some links to any other posts with good photography tips for the complete amateur if anyone knows of any? I think we need a better lens for our camera but I’m pretty clueless about what I should be getting. On Friday morning I was going to take them to the park but I was so shattered after a bad night that I just couldn’t find the energy to get everyone dressed when I didn’t have to (bad mummy). So instead we stayed at home and had a pyjama day and I made a sort of den in the playroom with my wraps. Mabel especially loved playing in the den, until it fell down, which was just as well really because Ernie needed a nap and I didn’t have a wrap to put him in because they were all part of the den! Thankyou for reading! Come and find me on Twitter/Facebook/Instagram, follow the blog by email if you want to make sure you never miss a post and if you like this post, I’d be absolutely made up if you shared it! With two other children demanding my attention, I sometimes feel like Ernie doesn’t get as much of me as I would like to give him. A lot of the time, he’s the quietest one out of the three, so he ends up sitting in his bouncy chair smiling at a plastic owl, while I try to explain to his sisters that 3 chocolate chip brioche rolls in one day is not happening and maybe they should have eaten the lunch that I just made them and they fed to the cat. One of the things that I like to do to reconnect with him (and ease my parental guilt), is baby yoga. 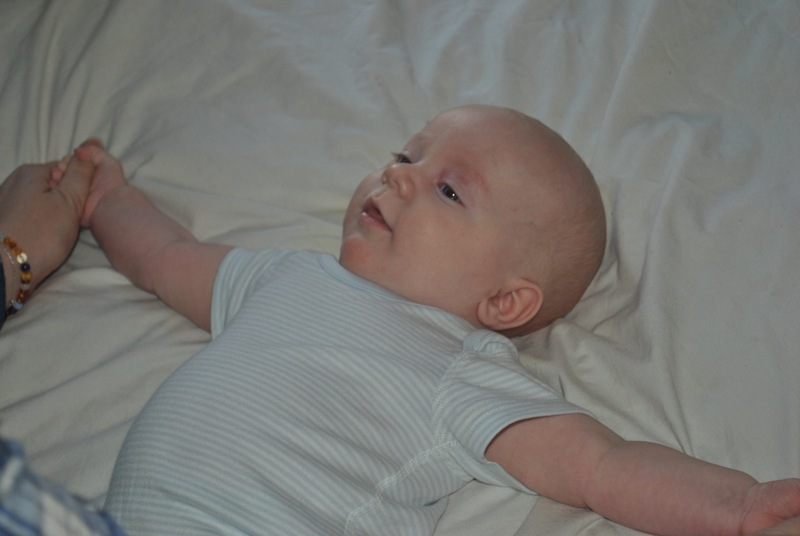 I first learnt about baby yoga when I took Mabel to classes, starting when she was 8 weeks old. We both loved the classes and I was really sad when we had to stop going because she learnt to crawl and kept going off to poke the other babies in the eye. When Greta was a baby I managed to make it to two classes with her, while someone else looked after Mabel. Now my poor neglected third child has no chance of making it to an actual baby yoga class, but luckily I remember enough of it to recreate at home. 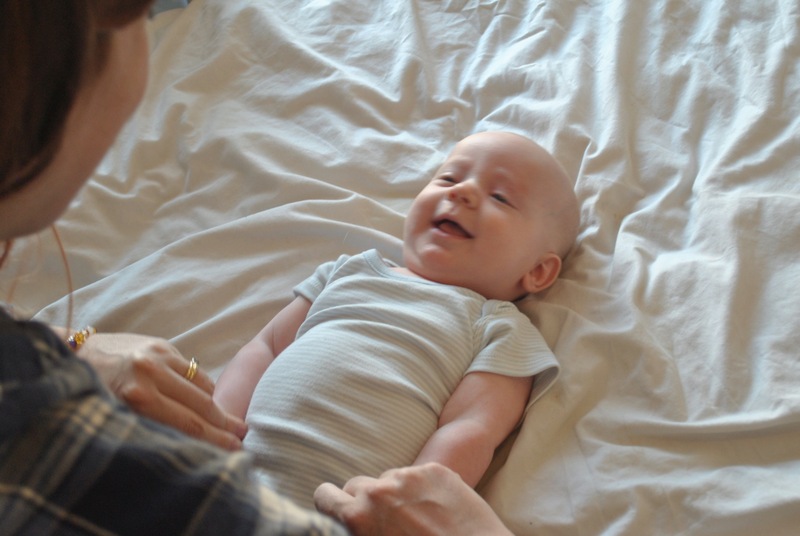 I do a lot of nursery rhymes and singing while I help him do some gentle stretches and he gives me lots of smiles and sometimes the odd fart too. It is actually great for helping them with any trapped wind, so sometimes we do it in the middle of the night in a desperate attempt to try and get him back to sleep. With all three of them I’ve found that they sleep really well during the day when we’ve done a baby yoga session, so that’s always a huge bonus! It definitely helps their development too, lots of time looking at Mummy’s face has got to be good for him right? I think I benefit from it too, I love the time I spend just solely concentrating on my baby. Of course finding the time to do it is always a bit tricky, but I find a Thursday morning when Mabel is at preschool is perfect. All I have to do is bribe Greta to stay in the front room with a Peter Rabbit DVD and 16 chocolate chip brioche rolls, ignore the pile of washing in the corner of the room and the floor that needs a hoover, and then we’re good to go. If you have a baby, I really recommend looking up a baby yoga class near you and having an instructor teach you some moves and then once you know what you’re doing you can give it a go at home too. Has anyone else tried baby yoga? What do you think? Any other tips for staying connected to a little one when there’s big children in the house too? We also love Babywearing to help with this and they’ll be posts coming up on that soon. Thank you for reading! Come and find me on Twitter/Facebook/Instagram, follow the blog by email if you want to make sure you never miss a post and if you like this post, I’d be absolutely made up if you shared it!